Stroke is the leading cause of long-term disability. It affects more than one million people in the E.U. and more than 700,000 in the U.S. each year. The major symptom of stroke is severe sensory and motor hemiparesis of the contralesional side of the body. Restoration of arm and hand function is essential for the patient to cope with activities of daily living (ADL). Sensorimotor movement therapies have positive effects on the rehabilitation of the upper limb function, and relevant factors for successful rehabilitation training include a high level of intensity, sufficient duration, and repetitive but variable movement tasks. However, with respect to these criteria, oneto- one manually assisted training has several limitations. It is more labor intensive, time consuming, and expensive. In contrast, robot-assisted arm training can reduce the number of therapist hours, whereas the duration and number of training sessions can be increased and well monitored. Furthermore, a robot enables repetitive training and can provide quantitative measures, stimulating biofeedback functions and supporting the assessment of the rehabilitation progress. The possible benefits of the robotic training are multifarious, if projected into the future. Patients may benefit from a more effective and diversified rehabilitation leading to an improved quality of life, while physiotherapists would benefit from a less physical workload, as well as resulting in a lower cost of healthcare. The ARMin arm therapy robot has been developed and tested at the ETH and University of Zurich in Switzerland. It has an exoskeleton structure that is empowered by six electric motors. The motors and gears are backdrivable and equipped with redundant position sensors, allowing the device either to control the position or the interacting force. The device can be used for left and right arm training and usually connects to the most affected arm. It can be operated in three modes: passive mobilization; active game-supported arm therapy; and active training of ADL. For passive mobilization, a teach and repeat procedure has been implemented, where the therapist can move the patient’s arm on an arbitrary but patient-individual trajectory, while the robot actively compensates friction and gravity. The recorded movement can be repeated by the robot while the patient is instructed to behave passively. In game mode, ARMin serves as an input device driving a graphical object (e.g. a ball or a cursor) inside a game scenario (e.g. a pingpong scenario). 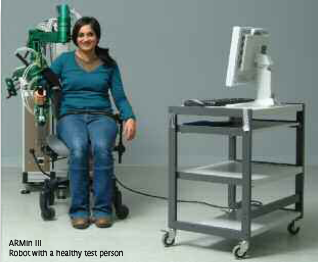 The robot detects the contribution of the patient to the movement and assists as much as necessary. In the ADL training mode, the patient has to solve an ADL task presented by the audiovisual display (e.g. set a table, fill a glass and drink). A key feature in the game and ADL mode is a specific patient-responsive strategy that supports the patient only as much as needed. Current ADL training tasks include setting a table, cooking, filling a cup, drinking, eating, personal hygiene, using a ticket machine, and playing the piano. We expect that the training of functional movements will facilitate the carry-over of gains in motor abilities into improvements that are relevant to ADL. After approval from the institutional review board, preliminary tests were performed on more than 20 stroke subjects in order to evaluate the technical and ergonomic functionality of the different ARMin versions – I, II and III. A first pilot study with three chronic stroke subjects was performed in order to investigate whether the arm training with the robotic rehabilitation device ARMin I improves motor function of the paretic upper extremity. The study had an A-B design with two weeks of multiple baseline measurements (A), eight weeks of training (B) with respective measurement, and a followup measurement eight weeks after training. The training included shoulder and elbow movements induced by ARMin I. Two subjects had three one hour sessions per week and one subject received five one hour sessions per week. The main outcome measurement was the upper limb portion of the Fugl-Meyer Assessment (FMA). It showed moderate, but significant improvement in all three subjects (p<0.05). Most improvements were maintained eight weeks after discharge. However, patients stated that the daily use of their paretic arm in the real world did not change. This could be explained by the fact that mainly non-ADL related proximal joint movements were trained (with only three degrees of freedom). 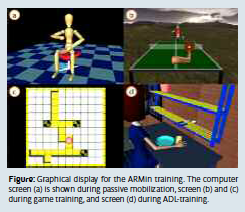 Therefore, another study was performed to investigate the effects of intensive arm training on motor performance, using the ARMin II robot, incorporating distal joints and ADL tasks were. This study included four chronic stroke subjects that received robot-assisted therapy over a period of eight weeks, three to four days per week, one hour per day. Two patients had four one hour training sessions per week, and the other two patients had three one hour training sessions per week. The primary outcome variable was the FMA of the upper extremity. Secondary outcomes were the Wolf Motor Function Test (WMFT), maximum voluntary joint torques, and further scores to assess transfer effects. Three out of four patients showed pronounced and significant improvements (p<0.05) in the main outcome measure, and were in line with improvements in the secondary outcome measurements as well. Most improvements were maintained, and some even further increased between discharge and the six month follow-up. The data clearly indicate that the intensive arm therapy with the ARMin robot can significantly improve motor function of the paretic arm in some stroke patients. Even those who are in a chronic state yield sustainable results. These findings encouraged us to start a subsequent controlled randomized clinical trial. The prospective controlled and randomized study started in 2009. Its goal is to compare task oriented robot-aided therapy to conventional therapy with respect to promoting functional recovery of the paralyzed arm. The study is ongoing and a total number of 80 chronic stroke patients will be included. Meanwhile, an industrial partner (Hocoma AG, Volketswil, Switzerland) is commercializing the ARMin technology. The commercial version of the ARMin robot is named ArmeoPower® and is expected to be available for sale in 2011. We expect that the data that has been collected within the prospective randomized clinical trial and the commercial availability of the device will facilitate its transfer from the research lab into rehabilitation clinics. Acknowledgment: We thank all people who contributed to the development and clinical evaluation of the ARMin, including Prof. Dr. med. 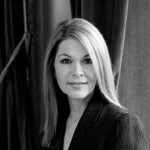 V. Dietz, M. Guidali, Dr. med. V. Klamroth, A. Brunschweiler, A. Rotta and A. Kollmar. Furthermore, we thank all participating patients and our clinical partners that are contributing to the multicenter study. The research was and is still funded in part by NCCR Neuro, Swiss National Science Foundation, Hans-Eggenberger Foundation, Bangerter-Rhyner Foundation and ETH Foundation.